When the temperatures drop and the chill sets in, travel dreams often involve beaches and bathing suits. However, come winter time, there’s no reason why your perfect vacation can’t be to a cold-weather destination - in fact, there’s nothing better than cozying up by a roaring fire with a hot cocktail in hand and watching the snow fall from the comfortable indoors. At these five warm and welcoming hotels, you can catch up on your much-needed R&R while doing nothing more than watching their glowing fires. Bonus: someone else gets to sweep out the ashes afterwards. While this seaside resort town is often thought of as a summer destination, winter is a great time to experience the charm of New England minus the crowds. At its chicest (and only LEED-certified) hotel, sitting directly on the water, each of the 28 rooms and suites has its own gas fireplace. 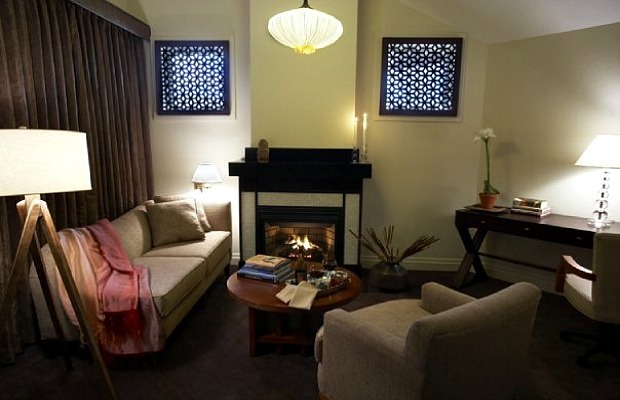 Should you desire a reclusive retreat, you never have to leave the room. Simply lounge around in the bathrobe and slippers provided by the hotel, order one of their five signature spiked hot chocolates (dark chocolate raspberry, anyone? ), and let the fire work its magic. Rates usually start at $395, but off-season prices are as low as $279. From October 2013-January 2014, a personal holiday butler can be booked for $500. The mountains of upstate New York are ideal for skiing, hiking, and even ice climbing, but with your in-room fireplace and a spa that offers winter cranberry body scrubs, you might never want to leave this hotel. If you’ve got romance in mind, check in to one of their contemporary suites in the adults-only Inn, or book a stay in the log-cabin-inspired Lodge for a family vacation. You’ll want to leave the room at least once, to enjoy comfort foods like homestyle mac and cheese and maple glazed pork loin at their restaurant, but once the meal is over, head right back to that roaring fire that’s all yours. Rates usually range from $199-$399 at the Inn. Rates in the lodge range from $159-$329. 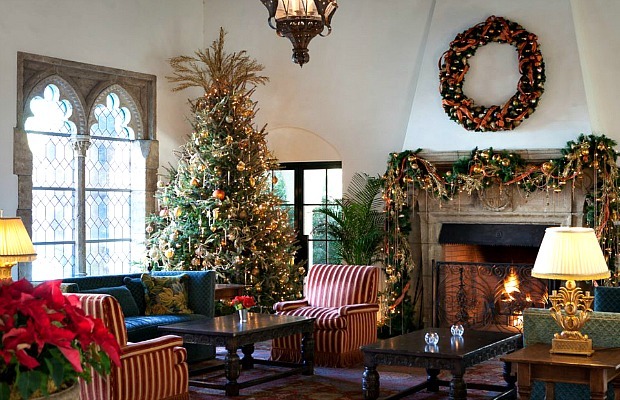 At this tranquil resort, the English country manor atmosphere is perfect for a cozy winter escape. While the overstuffed chairs, rich woods, and spectacular views from the guest rooms are more than inviting, the highlight might just be the grand, wood-burning fireplace in the leather-ceilinged Oak Room. To complete the winter-in-England feel, enjoy a fireside traditional high tea served by butlers, or simply sit back and unwind with a fine scotch and a good book. Rates start at $350 for a winter stay, with rooms available as low as $315 by paying the entire stay in advance. Guests at this hip downtown hotel can escape the chaos and cold of the city while stepping back in time. 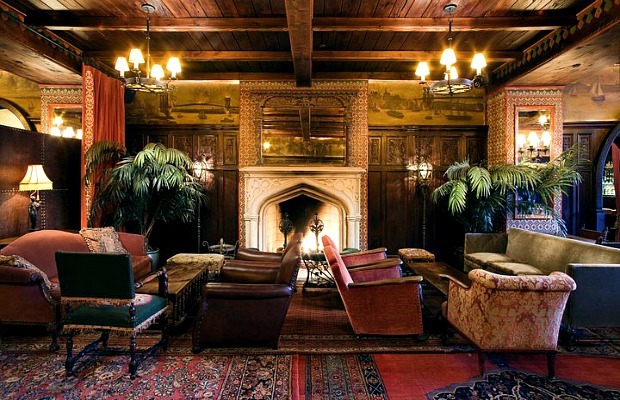 The heart and soul of the vaulted, antique-filled lobby is the huge Gothic fireplace, which invites you to lounge around for hours. Wrapping the walls of the room is a mural depicting 19th-century NYC – the perfect way to complete the time-travel experience. Grab a hot mulled cider or Ginger & Spice cocktail at the bar, then continue the art of nothingness and perfect the sport of fire-watching. Rates start at $425 for a midweek winter stay. Situated on 22 sprawling acres overlooking the gorgeous Berkshire Mountains, this former “summer cottage” was built in 1893 as wedding gift to a young countess. 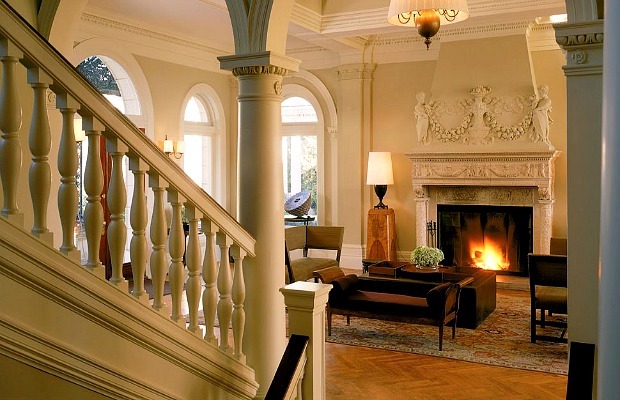 Today, guests can feel like nobility when they sit by the intricately carved marble fireplace. When the snow falls, the Italian-style villa and surrounding grounds become a winter wonderland, and the in-suite fireplaces keep things elegant and cozy. Venturing beyond the luxurious rooms brings yet another grand fireplace in the award-winning Dining Room, where floor-to-ceiling windows bring the wintery outdoors in – minus the cold.